HOW DO YOU USE YOUR LCP SYSTEM ? Unique to our Team only is a LCP SYSTEM that has been made available, FREE OF CHARGE, to all members of this team and their downline. What is this LCP system all about? Basically it is a well designed and professionally made LCP that can be replicated infinite numbers of times within minutes. As if that were not good enough, each member who receives one of these LCP's will also have access to their own back office in the system where there is a system Auto Responder that sends out automatic messages to your leads on your. You can mange your own leads yourself right from you back office, broadcast messages to them and basically be in full control of your marketing efforts. Of course this system is still regulated by the admin account ( which belongs to me) but as long as you use it for the purpose for which it was intended, you will have no problems. With this said, you need to know your way around the back office of the system to ensure that you maximize this opportunity that you have been provided with. And as long as you provide the necessary information to show that you are in this team's downline, then you can have one for yourself. The CAPTURE PAGES tab is already set so please leave this alone and don't interfere with it. The AUTO RESPONSES tab is where you can see, view and edit the AR messages. They are already set and will be altered , new ones added from time to time so try not to mess with them too much. You do need to go to that page and do something very important though. 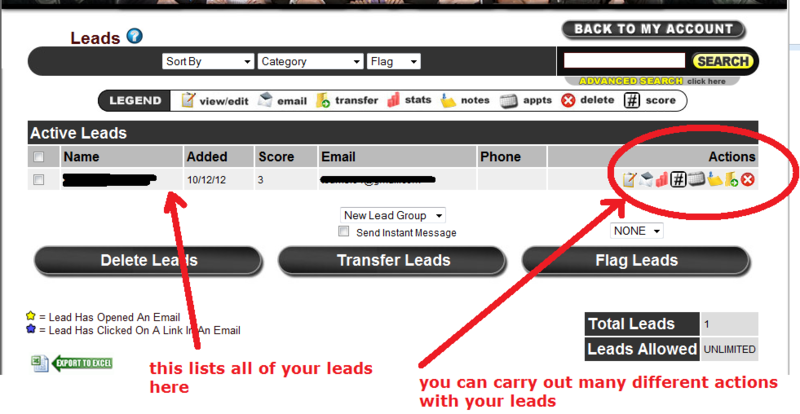 When the LCP is first set up, it seems to be set in a way to only allow the 1st auto responder letter to be active, so you MUST GO to that page and click on the yellow link that says "LOAD ALL ACTIVE LEADS MESSAGE"
It is only in this way that ALL of the messages in the Auto Responder becomes set to go out in the manner in which they were set to be sent. 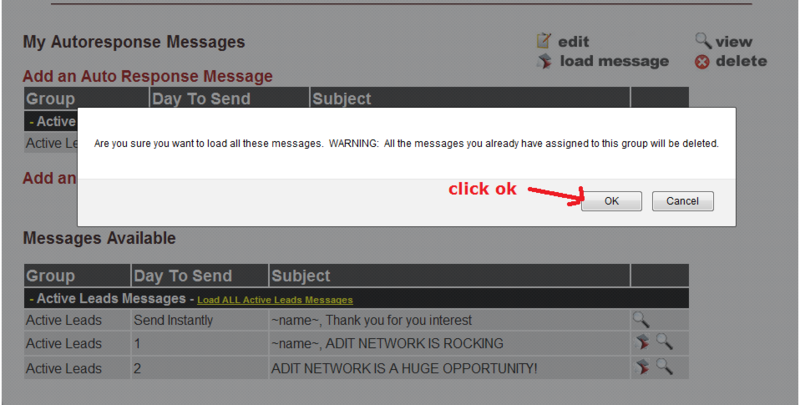 The second diagram shows when you click on the link and all the messages are moved to the top and are set to go out one after the next. Please ensure that you follow this step otherwise only the first AR message will go out to your leads and the others will not be active. Please look through all of the other features of the back office. 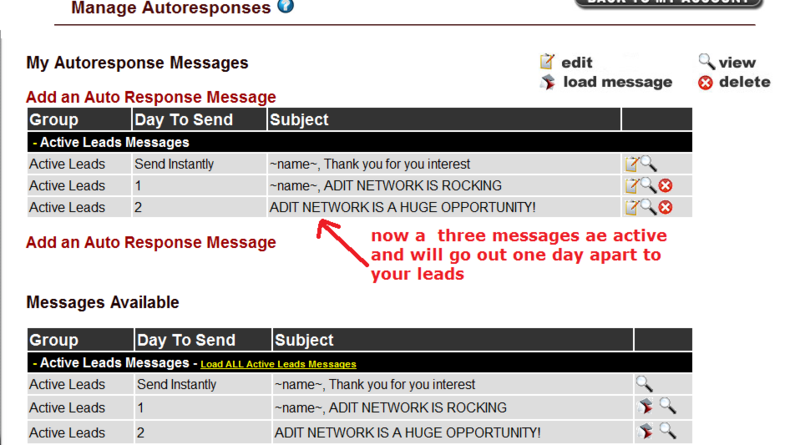 You really do have an entire marketing system right here at your disposal. It has been provided to you free of charge and it is hoped that you make the most of it and the Adit Network opportunity for which it was designed.